Finding a VPN for Mac ins’t as simple as it sound. First off, many VPNs don’t have a standalone app for Mac devices. That means need to install a third-party software (like the separate OpenVPN client) and manually set it up. So instead of downloading a simple Mac app and getting connected instantly, you’ll have to fumble around with this complicated workaround to manually connect to the VPN. A dedicated Mac app is just the beginning, though. You don’t want to sacrifice speed for the security or the opposite. Many VPNs can be slow performing or simply leak your IP or DNS address. Mac VPN should use the latest protocol and encryption options, like OpenVPN and AES-256 bit encryption. Strict “no-logging” policies are acceptable, otherwise the VPN could track your activity and sell it off to the highest advertiser. Finally, you won’t really be able to stream anything on Netflix or use torrenting unless your server speeds remain fast. NordVPN is the best pick for regular MacBook users based on our tests. The Mac app features a drag-and-drop map to select a new server location. All 5,200 servers in 62 countries are also featured on the left-sided menu. And it comes with a built-in kill switch that will automatically cut your connection if your WiFi drops (so your true location isn’t accidentally exposed). 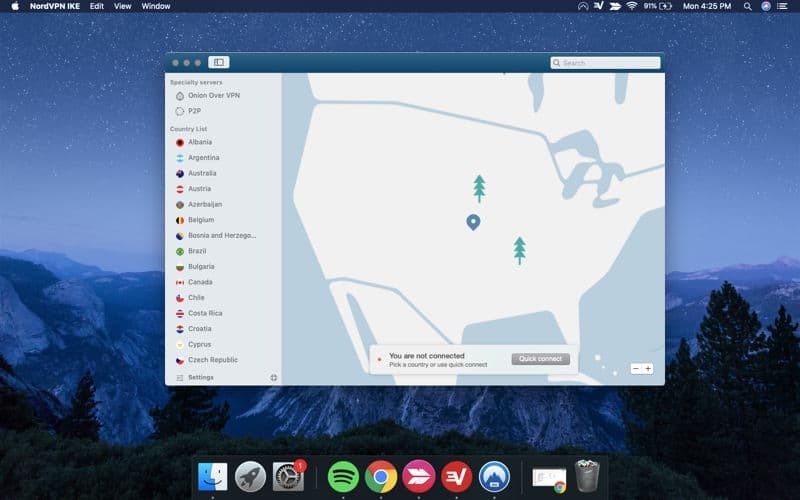 NordVPN is available across Mac, iOS, Windows, Android, and Linux. Plus, about 40 other operating systems and routers. You can use up to six simultaneous connections at any time. The industry standard, OpenVPN, is the default protocol on the Mac app. But they also allow you to switch over to IKEv2/IPSec if needed. NordVPN is also the only VPN provider on this list that features both a double VPN and obfuscated servers. The Double Data Encryption wraps your connection in two VPN layers for additional security. While the obfuscated servers can help you bypass network firewalls, so it’s perfect for people with restricted access in your home country. Their connection speeds are solid, too. We started off with a speed of around 98 Mbps (without a VPN), and after connecting to NordVPN, we averaged 74 Mbps. That’s still plenty of speed to get lag-free streaming on Netflix (no restrictions) or torrenting (on their specially-designed P2P servers). But the best part about NordVPN? They’re currently running a special where you can get NordVPN for just $2.99 per month with a three-year commitment. That’s a massive cost savings from the $6.99/month normal price, so locking-in that low deal makes sense if you’re serious about privacy and security. 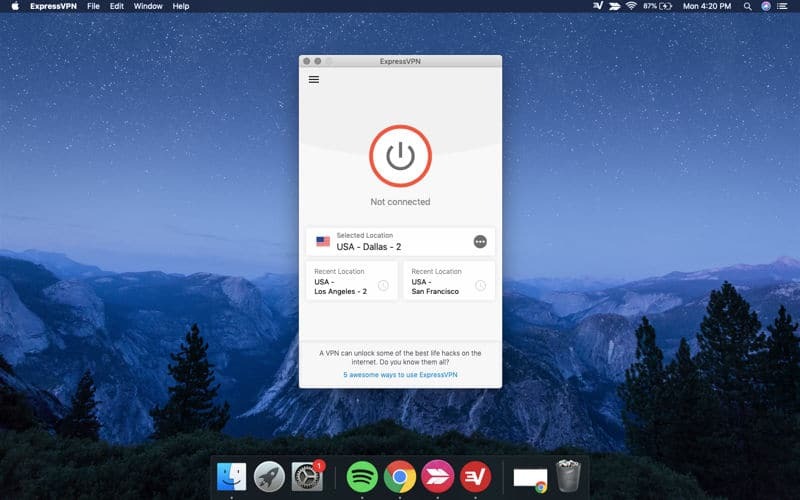 The ExpressVPN Mac app features one-click connection that automatically joins the closest Smart Location. These VPN servers are optimized to deliver the best performance out of the box. Just open the app, hit the “Connect” button, and you’re logged on in seconds. If you’re trying to bypass local restrictions, you can manually select any international server directly from the main screen (without having to dig through countless menu options). ExpressVPN’s Mac app isn’t just pretty to look at, though. It’s also blazing fast. We started with a 100 Mbps connection before logging in, and the secure connection only dropped the download speed to 83.15 Mbps. Barely noticeable! ExpressVPN doesn’t skimp on security to deliver these speeds, either. They have a kill switch and anonymous IP address available for all of their 3,000+ servers in 93 countries. Netflix, torrenting, and P2P servers all worked like a dream as well. We’re happy to report that their Mac app is 100% leak-free. And it defaults to OpenVPN, the best protocol in the world with rock-solid AES 256-bit encryption, while still offering access to SSTP, L2Tp/IPsec, and PPTP protocols. As good as all of that sounds (and it is good), there are two drawbacks with the service. The first is that you can only connect three devices simultaneously (vs. the five to ten from other services). The second issue is the price. It’s more expensive at $6.67/month (for annual plans with our deal). All plans do come with a 30-day money-back guarantee. But this isn’t a wallet-friendly service for people on a strict budget. 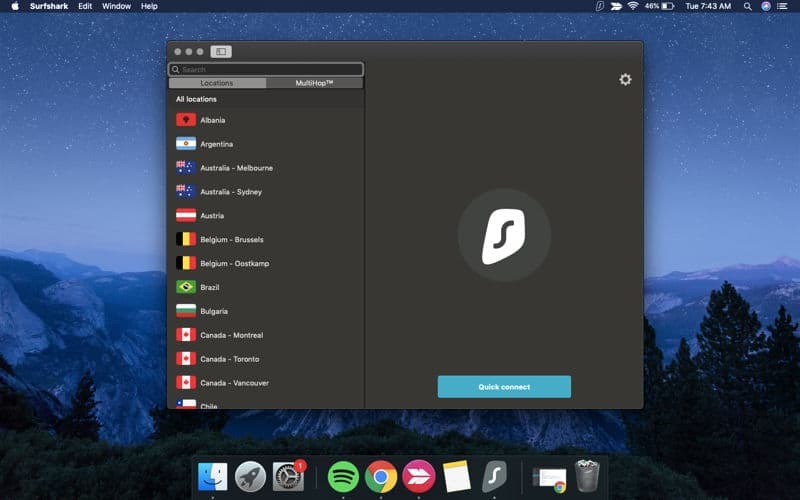 The Surfshark Mac app has a “Quick Connect” button that will instantly get you on one of their servers within seconds. From there, you can switch to any of the other 800+ servers in 50 countries or change protocols from OpenVPN to IKEv2/IPsec within about two clicks each. Beyond Mac devices, Surfshark has prebuilt apps for iOS, Windows, Android, Linux, Chrome, Firefox, and routers (through OpenVPN). Most of these apps have a kill switch, except for the Android version (currently in development). Surfshark has a legitimate no-logging policy. We even ran their connection through five different leak tests and found that all of them came back negative. I was able to easily stream Netflix on six different servers (from LA to South Korea). Torrenting and TOR are also 100% allowed. The only slight hiccup was some speed inconsistencies. For example, our initial download speed was 98.71 Mbps. A Netherlands server was 25% slower (71.06 Mbps), while a U.S. server was 50% slower (48.99 Mbps) and the Hong Kong one was nearly 75% slower (25.74 Mbps). The sliver lining is that the pricing is the lowest we’ve seen from over 70+ different VPN companies. The two-year plan is only $1.99 a month! You can sign up for the free 30-day trial to try them out. Then, if everything looks good, use everything from major credit cards to PayPal, cryptocurrencies, Dragonpay, Tenpay, and Alipay to pay. Surfshark even throws in a 30-day money-back guarantee if anything happens during the first few weeks. ProtonVPN’s Mac app features a giant map with tiny pins that highlight all 345 servers in 32 countries. Thats not the largest number of servers, but it does make it easy to flip through them all on the map or menu on the left-hand side. If you’re looking for an automatic connection, the “Quick Connect” button will log you on to a smart server ASAP. 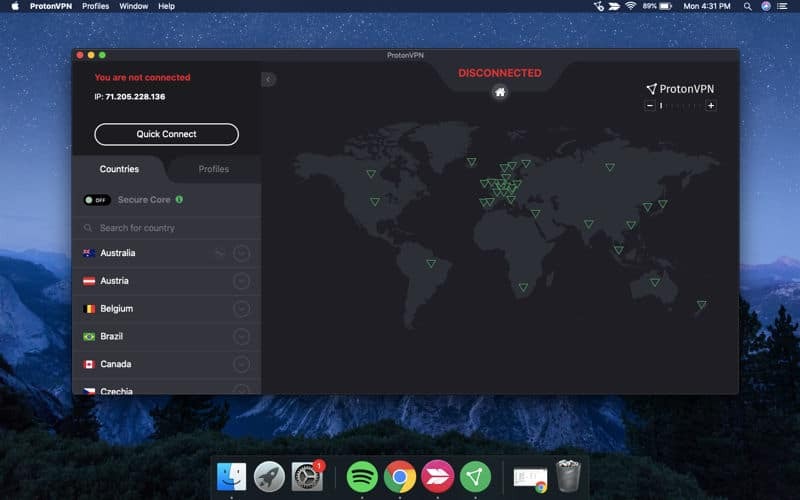 ProtonVPN has a ready-made apps for Mac, iOS, Windows, Android, and Linux, in addition to DD-WRT, AsusWRT, and Tomato routers. Even though the total server count might be on the low side, they allow you to connect up to ten devices at once. The ProtonVPN Mac app defaults to OpenVPN (UDP/TCP) with best-in-class AES-256 encryption. Except, this is also the only protocol that they offer. So that might not work if you’re using older (or limited) devices like Chromebooks. Fortunately, we didn’t find any leaks on this connection and Proton has a strict no-logging policy in place. However, their speed tests left a lot to be desired. We started with the same benchmark connection speed as the others. Then, we connected to their servers in the US, Switzerland, Hong Kong, and the UK. Almost all of them were slow, killing our Internet speed anywhere from ~40% to ~80%. We were able to stream Netflix on one of ProtonVPN’s Netherland servers, but the other four failed. They also don’t allow restriction-free torrenting, limiting you to certain P2P servers and reiterating that you should only be using them for personal (not commercial) use. ProtonVPN’s main paid option (“Basic”) starts at $4/month for the year (with upgrade plans that get even more expensive). All plans come with a 30-day money-back guarantee, with a catch that your refund balance will be prorated based on use. IPVanish offers a fully-featured Mac app. You can customize nearly anything on it. However, that also means there are more settings and options to filter through initially. IPVanish provides access to over 60 countries and 1,200 different servers. And you can connect up to ten devices to these servers. The Mac and Windows apps do now come with kill switches, too. You’ll be happy to know that IPVanish gives you access to OpenVPN, PPTP, and L2TP protocols. (Stick with OpenVPN and its bank-grade AES-256 encryption if you’re unsure.) They also have a SOCKS proxy server that gives you privacy without needing to download any app at all. Our leak tests all came out clean. However, IPVanish’s history with logging gave us a slight pause. On paper, it’s a legit “no logs” policy. But in 2016 there was some news about their user data ending up in the hands of Homeland Security. Only one of the four servers we tested with Netflix worked (Chicago). Though, they do highly encourage both torrenting and TOR. IPVanish also delivered inconsistent speed tests. The EU (Amsterdam) server only dropped a little from ~100 Mbps to 82.67, but the US (New York) one fell all the way to 34.71 Mbps. The best deal I was able to find was the $77.99 annual plan ($6.49 per month), which is still pretty high when you compare it to the top three cheaper (and better) options on this list. If you’re interested, you can give them a go using credit, PayPal, or Bitcoin, and enjoy a 7-day money-back guarantee. 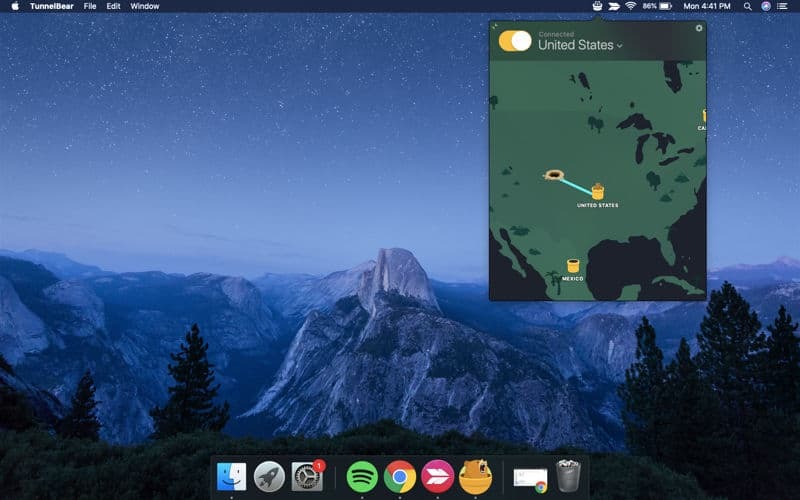 TunnelBear might have the most enjoyable Mac app out of all 70+ VPNs we’ve reviewed. The visual interface shows you a little bear next to your location. When you click on a server location that’s close by, the bear literally tunnels to the new destination. They’ve managed to make something as dry and boring as picking a server location entertaining. You could probably spend an entire afternoon clicking through each of their 350 servers in 22 countries and not completely hate it. Besides the Mac app, this same fun plays out on iOS, Windows, Android, Chrome, and Opera. These come with kill switches, an anonymous IP, “Ghostbear” that will hide mask your VPN connection, and up to five device connections. The Mac, Windows, and Android apps default to OpenVPN, while iOS apps get IPSec/IKEv2. TunnelBear did not leak any data in our five tests, and they do not log any of your personal information, either. But even though TunnelBear’s support claimed that their servers worked with Netflix, we weren’t able to successfully stream anything. Thankfully, torrenting and TOR are allowed. The other downside was the speed decrease. Our 100 Mbps connection was quickly slashed in half to 52.26 Mbps on their EU servers, and it continued to get worse — a London server only managed a 7.54 Mbps (!) download speed. TunnelBear’s lowest pricing is $59.99 for the year (~$4.99/month). However, instead of a money-back guarantee (there is none), they provide access to a limited free version for you to try out. Windscribe’s Mac client has zero frills. Click on the icon at the top, and it drops down a few different server options. That’s about it. No as much fun as TunnelBear, but it does exactly what it’s supposed to: connect you within seconds. You can access over 480 servers in 50 countries on pretty much any device in your home, including iOS, Window, Mac, Linux, Chrome, Opera, Firefox, select routers, Amazon, Nvidia Shield, and even Kodi! We did spot an issue with that server number claim, though. Their website listed New Zealand as a location. However, when we tried looking for it inside the app, it didn’t exist! So you might not actually get up to the 480 they’re claiming. On the other hand, Windscribe did not have any leaks or logging in our tests. Major protocols, including OpenVPN, IKEv2, and SOCKS5, are all offered. But you might want to switch the default IKEv2 back over to OpenVPN in most cases to get the strongest encryption. Windscribe’s speeds let us down, getting anywhere from 56% slower in some cases (EU server) to 82% in others (UK). You’ll have to use their special “Windflix” servers to stream Netflix (‘normal’ ones didn’t work). And you will also need to use special servers to torrent, too. Windscribe’s cheapest plan comes down to $4.08/month for a year. They also have a “Build a Plan” plan that only costs a dollar per location. You can pay with credit, PayPal, or Bitcoin. But if you think you might want to get a refund, you’ll need to do it within three days of purchasing the product and you can’t go over 10GB of bandwidth during that time. Which VPN Mac App Should You Choose? Unfortunately, not all Mac VPN apps are secure or fast. Some “Mac” ones don’t even actually work on Macs without jumping through a ton of confusing, time-consuming hoops. That’s why we picked out the top 7 VPNs for Mac devices based on our actual experience testing each one. 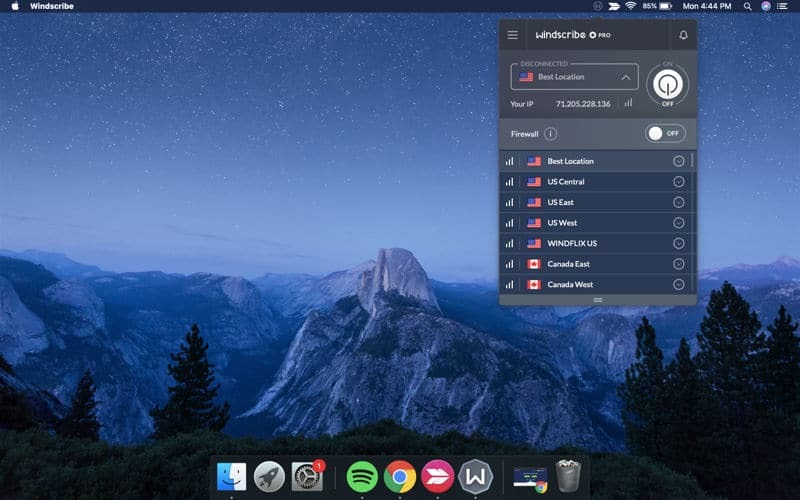 NordVPN comes out at the top of the list with a winning combination of strong security, tons of features, the most available servers, and affordable pricing. ExpressVPN and Surfshark are a close second and third respectively. The first one will get you better speeds, but the second one is significantly cheaper. ProtonVPN, IPVanish, and TunnelBear all have a few positives… with a few glaring negatives as well. They’re OK overall, but not anywhere near the top three. 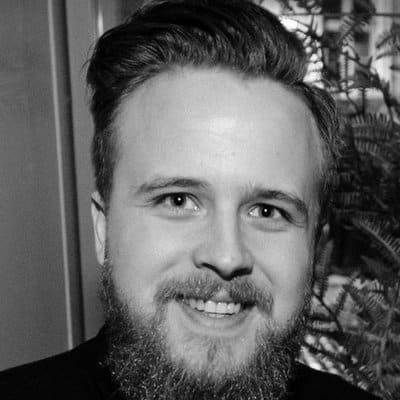 And Windscribe had issue after issue, so we can’t recommend it at all. I think NordVPN was relatively new when I first signed up to it, but it looks like the service is improving constantly. Speed is increasing even though more users use it, probably because they seem to be adding more and more servers. Well, sure, it would be nice to be able to select servers by the city rather than by number and maybe Netflix could work with more servers, but in general it works well and I’m still happy with it. I am using Hide Me VPN on my macbook and it works pretty seamless. They have an easy to use and robust software for mac which can connect to servers in 34 countries. It offers p2p so torrenting is also fast. It’s been a while since I installed NordVPN on my MacBook air, I don’t like to jump to any conclusions too quickly. To be frank I don’t have much to complain about – it’s pretty awesome, Netflix works, I can torrent without a major speed drop and that’s basically all I need.